Bagels are prepared with normal wheat bread dough, so a lot of this post is a copy of my “Wheat Bread” post. The dough and its preparation are identical, just the baking is different. Boil water in a wide cooking pan, adding soda and sugar. Sprinkle flour on the work surface, and spread the dough gently without kneading, abou an inch high. 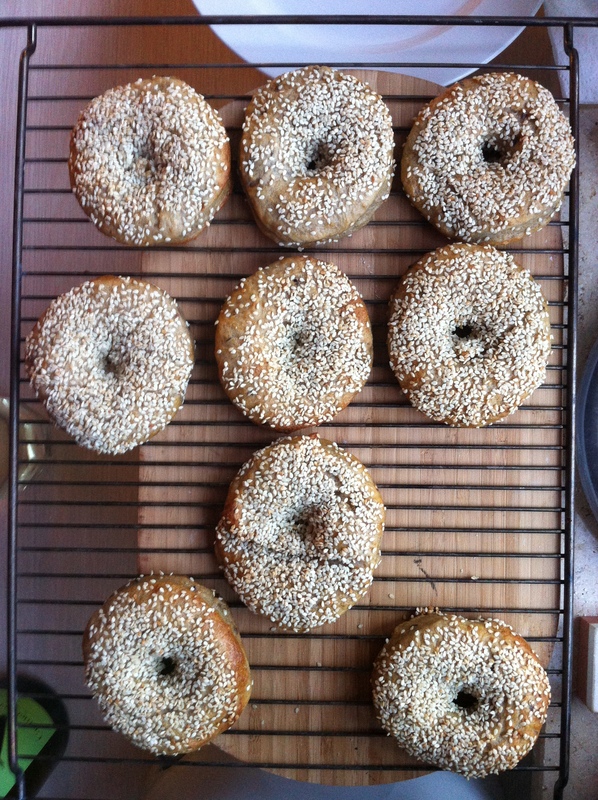 Shape into bagels – I use a 2 1/2″ cookie cutter, and a wooden spoon to make a hole in the center. Place the leftovers in a small bowl – that will be your new yeast sponge! Boil bagels, 3 or 4 at a time, until they expand visibly. Put on baking sheet and sprinkle with seeds. When all are done, bake for about 30 minutes.